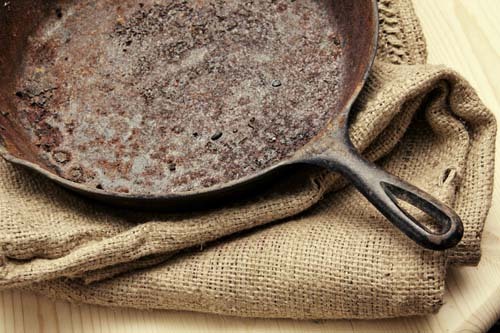 As you can guess from pretty much every post on this blog, I am deeply devoted to cast iron. In fact, in the hierarchy of food related things that I love I’m pretty sure it goes 1. Pie 2. Bagel Sandwiches 3. Cast Iron. And often, #3 is an important factor in achieving #1 and #2. There’s something magical about cast iron- it’s durable, non-stick, beautiful, reliable. Consistent. It’s everything that my very expensive stainless steel pans are not. In fact, in the years that we’ve had both cast iron and stainless steel our cast iron has never left our stove top. It moves seamlessly from fried pickles to caramel to sopapillas. Can you tell I love it? Today I’d like to introduce a new series on Biscuits and Such, The Cast Iron Chronicles. Creating series, sharing behind-the-scenes peeks, tutorial posts, and overusing the ever controversial serial comma are all part of the big-picture goals for 2012. As long as that sounds good to you, of course. Anyway, back to The Cast Iron Chronicles. My friends Brit & Aaron (coconspirators in the Dan-turns-27-party plan) recently moved from LA to Alexandria. 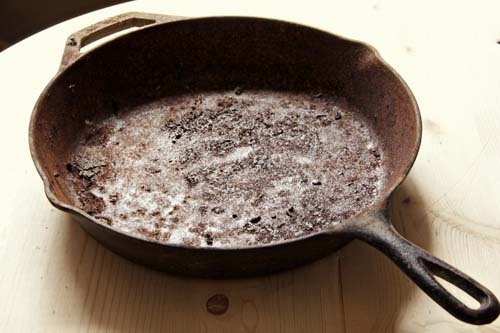 When they moved into their new house they found (among other things) this cast iron pan in their back yard. As you can see, it’s in bad shape. Covered in rust, battered and weather-worn. I immediately claimed it. They brought it up when they came for the party and today I finally took a crack at it. This series, probably four or five installments, will follow the pan as I remove the rust, dirt, and grime and bring this beauty back to her former glory. 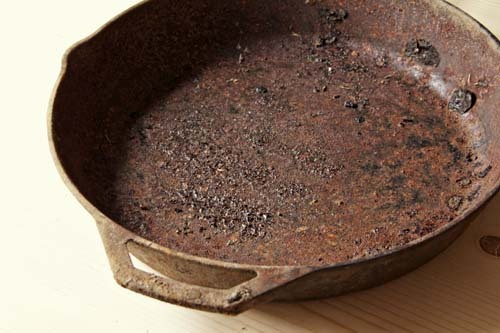 My plan is to use a combination of steel wool, sand paper, and vegetable fats to remove the rust and season it again. The Capt’n gave me a few tips, as he has restored many a cast iron cookware item in his day, including Sybil’s cauldron. Even so, I’d love to hear any tips you have for conditioning cast iron, or anystories from your own projects. This should be a fun ride! I’m going to enjoy this series. My husband and I have a great collection of cast iron and even cook on a wood stove. I’m very fortunate to have inherited all of my grandmother’s and mother’s ironware. I have to admit, I have never owned anything cast iron, unless you count my Le Creuset dutch ovens (which I LOVE). My dad has a few cast irons dutch ovens and I have always wanted one but have been a little intimidated by the care and seasoning of them. I love that you’re doing this as I will be following and learning along the way! I cannot WAIT to read more about this series! My Daddy gave me his great-Granny’s old cast iron pan several years ago and, as you will know and appreciate, that pan has seen it all. It’s so revered I’m afraid to use it, and I suspect she could do with some tidying, herself. Can’t wait to read and learn more! I am excited about this series. 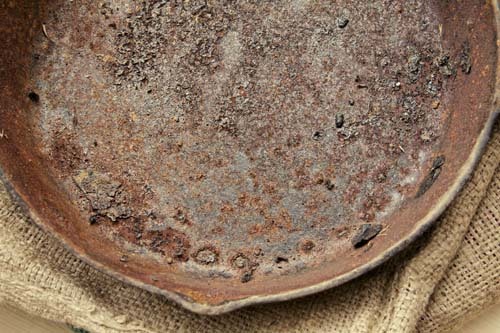 I have a couple of pans, but I do come across them in bad shape in garage sales and flee markets. I feel like I should save them, and now with your knowledge and know-how I can. Can’t wait to read and learn more! I just came across this. I’m super excited to follow along. I was handed-down my Grandma’s cast iron and I want to make sure I take proper care of it. Brilliant …… self cleaning oven ….. brilliant idea!!!! Thanks!! !